HALLIE JACKSON: I know there's something else that has been on your mind and a lot of folks' minds, and that is some comments and some backlash now to Congresswoman Ilhan Omar, after some comments surfaced this week in which and I want to play it, she said something about the 9/11 attacks. I want to talk about your reaction to the backlash and your reaction to the comment in two pieces. So here is that remark, Congresswoman. HALLIE JACKSON: And it's that phrase, some people did something, that is being picked up on by some of the Congresswoman’s critics, including for example, the cover of the New York Post, which I’ll ask you about in a second. But on these remarks themselves, some people did something as a reference to 9/11, do you think she should have rethought her words? Do you worry about the appropriateness of that? REP. RASHIDA TLAIB: They do this all the time to us, especially women of color, they do that, they take our words out of context because they're afraid, because we speak truth, we speak truth to power. My sister Ilhan Omar, what she was talking about was up lifting people by supporting their civil liberties and civil rights. She has always, always condemned any kind of strategy, especially of a person that is directly impacted by being a refugee herself. She sees what terrorism can do, she sees what violence can do to a whole country, to a whole people. Taking it out of context, this is just pure racist act by many of those, hateful acts, by those because she does speak truth, when it talks about different issues that they don't disagree with and I’m really outraged. 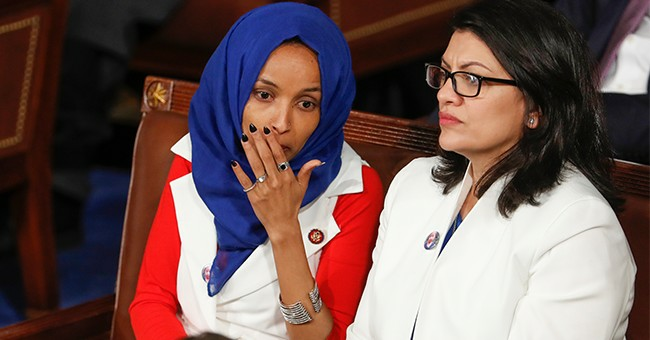 Now, I have to admit, this is a much better defense—for lack of a better term—for Omar’s remarks than Pelosi who insinuated that Omar was just too stupid to know what she’s saying after her most recent anti-Semitism episode. She accused supporters of Israel of exhibiting dual loyalty. Tlaib’s ‘you just don’t get it’ defense is slightly more grounded…if you’re a brain-dead liberal or a MSNBC viewer. You see, you’re just not ready for how one defends terrorism openly I guess. Yeah, and I’ll never be ready. No real American would ever support marginalizing, downplaying, or rationalizing such evil. Not one. Okay—maybe snobby, urban progressive elites would—but that’s an ‘as expected’ response from those who already hate this country.